Hello to you! I'm wondering, have you ever created something and you just were not sure you REALLY liked it? Well, that's what I've got for you today. I did learn a few things along the way. I started with a gessoed 6X12 canvas. With my fingers, I covered it with sky blue and white Claudine Hellmuth paint in the little squirt bottles. They are super easy to use and great for control of where you place your paint and how much you use. 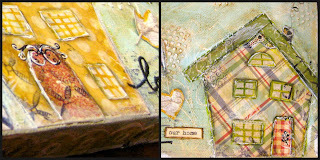 Then I did a little paper piecing for my homes with Summer Fresh from Simple Stories. LOVE this paper. Preeeeetttty!!! The colors totally rock and the designs are oh so yummy. We recently moved to a beautiful townhouse so these represent our neighbor's homes too. Once the houses were down with Matte Medium, I used a bit of modeling paste to create my clouds with some joint compound tape. Maybe just fluffy clouds with my fingers would have been a bit softer. I had some fun with my stamps (background 1, around the edge, basic backgrounds and background love). I think what pushed me over the edge with this project were all the random rubons I used from my stash. Oh well...live and learn! I also did do a little antiquing with tinted Gloss Medium. Oh and I added the little heart, used a marker to free hand the word "love" and found some words in a vintage book for "our home". 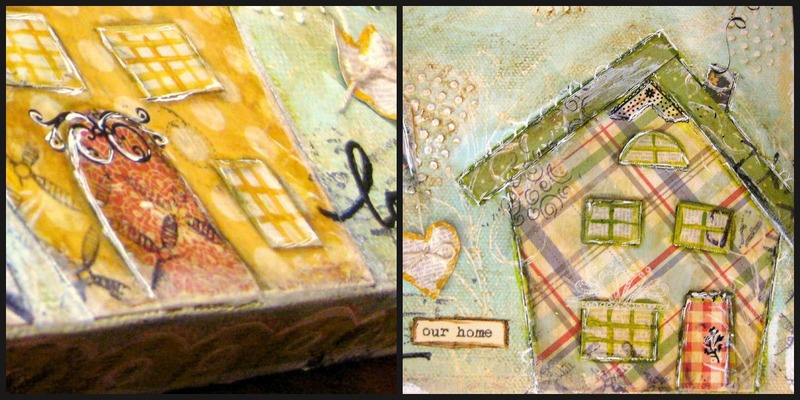 I also did a little edging with book pages and painted them. LOVE that look! Overall, I had fun, got paint on my fingers (which is a daily goal of mine) and I learned some valuable lessons. Hope you were inspired to get a tad bit of paint on your fingers. Enjoy! Wow, this is fantastic. I love the papers and all the detail you put into this. You should dancing with delight over this piece of art. Thanks for sharing.